After the international break Erik Lamela, Juan Foyth and Paulo Gazzaniga are all major doubts for Tottenham Hotspur as the Premier League returns to action this weekend. This development will be due to the fact that the three players were all away for international duty as Argentina faced Mexico at the UK time on Tuesday and the trio are not expected to make a return back to Tottenham Hotspur till Friday. According to Standard Sport, The three players are going to be a major doubt after Spurs coach Mauricio Pochettino made it very clear he was hesitant to play the Argentinian trio. There is a clear indication that Mauricio Pochettino worries are centered on the fact that the three players won’t be physically and mentally ready to face London rivals, Chelsea. 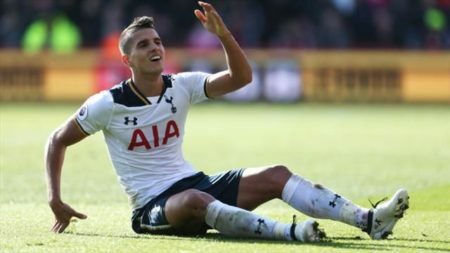 All is not lost for the Spurs as two of their top players will be prepared to feature in the London derby match against Chelsea. Christian Eriksen and Heung-min Son will both be ready and fit to play against Chelsea. As for Eriksen who is a key player for Tottenham, he was featured just in the first half as Denmark took on the Republic of Ireland. Son, on the other hand, was rested and did not participate in the two matches South Korea played during the international break. Tottenham are hoping to beat Chelsea so that they can boost a place in the top four.